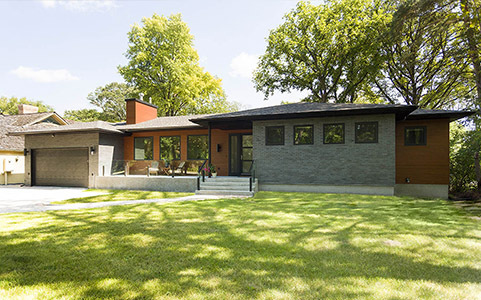 This project in Winnipeg started out as an interior renovation of a 1960s era bungalow. It ended up being a major structural rebuild. Even after 30 years of building experience and owning a company with 17 award recognitions to its credit, Wayne Sage, president of Harwood Design Builders, can still be surprised when taking on a renovation project. This 1960's era bungalow in Winnipeg's upscale Wildwood area was no exception. "We went there to do an interior renovation, a facelift that was to be largely cosmetic," Sage told Canadian Contractor. However, that all changed when the walls were opened up. "Whoever built that house should have been shot." Sage listed the many structural deficiencies that revealed themselves above or behind the walls: no headers over any windows, handmade rafters supported by pallets, vertical loads with no apparent bearing points. "I couldn't believe this house was still standing." What Sage and his team at Harwood Design Builders were able to achieve was remarkable. Not only did they transform a dark and sombre home into a bright and open modern living space, they essentially rebuilt the structure of the entire building. "We started from scratch," said Sage. "We removed the whole floor, fixed the foundation that was cracking, put up new floor joists and a new level floor, installed new roof trusses – we had to redo everything." The Wildwood neighborhood of Winnipeg runs alongside one of the deep bends of the curvaceous Red River. Homes are older and sit on spacious lots, this one almost two acres. Sage's clients wanted improved room orientations towards the river with an open interior concept. This required the removal of a few walls standing between the living room, kitchen and family area, and the shifting of some walls near the bedrooms. New triplepane windows ordered from Innotech in Germany were an important part of the new look. The floor-to-ceiling window panels running across the living room and kitchen-dining area tilt, pivot and turn five different ways, opening the home on the river side as the seasonal weather permits. Although homes in the area are large, Sage's clients were happy to simply upgrade the existing 2,500 sq. ft. main level living space and to leave the sub grade area as laundry, storage and utility rooms. The main level may be modest in area, however, the details are by no means modest in finishing quality. The large open family and kitchen areas, the master with ensuite, spare bedroom, powder room, and study with a Murphy bed all have beautiful touches throughout, something on which the Harwood design team prides itself. Sage's objective of building "a little above and beyond" includes energy efficiency. The combination of spray foam, stone wool and fibreglass insulation in the new celling delivers close to R60, well above required code. The walls are at least R30. The Harwood Design Builders team has 18 full time employees, including its own design capability. "We like to do everything in-house as much as we can," Sage explained. "This way, I have total control. I don't have to worry about who a subcontractor hired this week or who he's sending over." Some employees at Harwood have worked with Sage for ten or more years. For example, the site foreman on this project, Jeff Halstead, has been with the company for 12 years. This control over quality and production allows the Harwood team to run up to five projects at one time, rotating experienced crews across sites as required. Renovation currently represents 80 per cent of Harwood's business, although Sage feels that might change going forward. "The way things are in Winnipeg right now, people are buying $400,000 or $500,000 homes, tearing them down and starting over." Given their gilt-edge reputation in Winnipeg's high end market, Harwood could find itself with more newbuilds on its books. It won't change the way Sage conducts business, of course. "Most of our clients come to us because they like the one-stop shop," he said. "They want to go to one place and have everything taken care of. We do the design, the engineering, and we build it all ourselves – that's what they like about us." It results in a high level of customer satisfaction that often extends the relationship. "Clients become our friends," said Sage. "We have a company BBQ and some of them even come to that as well. They fall in love with my team, serve them lunches and all that. It speaks for my guys." Specific to this project, Sage's pleasure runs beyond the national recognition resulting from a 2018 CHBA category award nomination for a Whole House Renovation. "We were able to turn over a well-built home. There's nothing hidden, there won't be any problems. This was a house that could have collapsed around the clients. Now they'll never have any worries again."